Despite a remarkable change in performance in recent years, semiconductor power components remain and will remain one of the weak links of electrical energy conversion. Their relative fragility (limited temperature range and strict safe-operating area) makes them not robust with regard to extreme and accidental operation which are likely to occur during the life of the converter (e.g. short-circuits, loss of isolation and noisy control). Failure of a component is a critical event since there is a risk of explosion of the packaging and the propagation of failure within the system itself (high energy stored in sources) ; and also because it results in the interruption of operation of the related application (embedded systems, systems of lean production). For the last decade, this issue is at the heart of the research topic "safe and fault-tolerant operation" of CS group from Laplace and it is in connection with its academic and industrial partners. 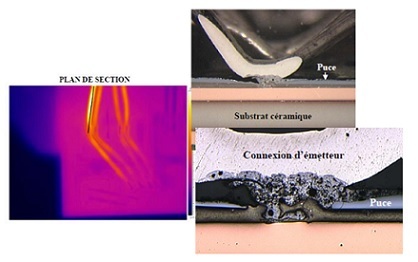 This topic is separated into two different areas : 1 - the characterization of the reliability and implementation of strategies for integrated thermal diagnosis semiconductor components ; 2 - the adaptation and design of new safe and fault tolerant conversion structures. Characterization of SOA and dynamic short-circuit capability in extreme conditions of semiconductors. 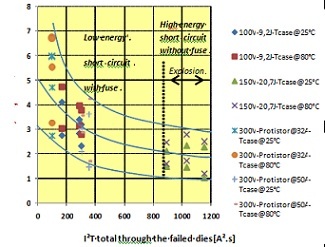 Characterization of failure modes and their ageing (critical energy, Rsc, I²T, energy of explosion). Thermal Diagnosis (Zth(t), Rth) of power assemblies and relating with their reliability and degradation. Electrical and thermal "on line" diagnosis of inverters using WBG components. Smart Driver approach. Design and technological development for passive safety built into the heart of the switching cells (fuses, switch and passive switch, ICT - automatic router backup). New safe architectures with embedded redundancy (active and passive) for fault tolerance of critical applications. Formalism for quantitative and qualitative evaluation of reliability rules incorporating redundancy and electrical and thermal surges. Monitoring and diagnosis of waveforms (time and frequency approaches) for "on-line" reconfiguration of control system (modulator and reconfigurable PWM system).